No matter how capable your tablet of choice is, chances are that a single drop on anything harder than a carpet will render it unusable, or at least cause some serious damage. That's why buying a case for it is always a good idea, and the makers of third-party accessories have plenty of them to offer. The availability of iPad cases, however, appears to be the broadest, and today we'll take a look at some of the ultimate protective iPad cases that money can buy. Which one do you think is the best? Do you know any great iPad protective cases that we've missed? Let us know down in the comments! With a layer of 10-millimeter shock-absorbing silicon at its corners, the Shockdrop iPad case by Hard Candy offers outstanding protection for your pricey gadget. At the same time, the iPad display is guarded by a replaceable, semi-rigid screen protector. The accessory is priced at $59.95 and will start shipping on February 1, 2013. At $89.99, the Extreme Portfolio for iPad by G-Form doesn't come cheap, but the protection that it offers is almost unbeatable. The special shock-absorbing material that is it utilizes is flexible under normal conditions, but strengthens when force is applied. The Ballistic Tough Jacket case for the iPad mini ensures the safety of your tablet with its three layers of protection. Extra shock-absorbing material is fitted on those vulnerable corners, and a front cover attachment protects the screen while the iPad mini is being carried. This tough iPad mini case can be yours for $59.99. 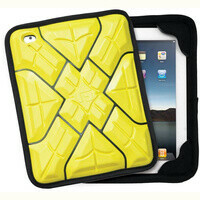 The Roklock iPad case gets its strength from the reinforced, impact-resistant polycarbonate it is made out of. It also comes with a screen protector to match. It is priced at $69, and for an extra $29 you can get a magnet kit that will make the tablet stick to metal surfaces. Without a doubt, the Survivor is the toughest iPad case that Griffin has ever made. It is meant to meet military specs for dirt, sand, water and shock damage, along with other environmental factors. It is built on a shatter-resistant polycarbonate frame dipped in shock-absorbing silicone. It comes in multiple color configurations and can be yours for $79.99. The $49.99 Cara iPad protective case by SwitchEasy is both tough and practical. It protects the tablet from every side and offers plenty of grip, but it can also act as a stand and it looks kind of nice as well. If money isn't a problem, you can waterproof your iPad with the Tank case by Moxiware. The accessory is designed to exceed military specifications, meaning that neither water, nor dust, nor dirt, nor shock can damage the tablet easily. This kind of protection, however, comes at a cost - $399.95, to be more specific. And last, but surely not least, we have the Drop Tech iPad mini case by Gumdrop. Priced at $59.95, it offers a reasonable amount of protection for its cost. The thick, rubber material is designed to absorb shock in case the tablet is damaged, and the screen cover ensures that the display stays free of scratches. Lifeproof is the best case maker for Apple iPhones and iPads...why omit them? Their case is better than all the garbage on this list. Don't buy those cases get a lifeproof. LMAO @ #9. A $400 iPad case?! Seriously?! I'd like to see the sales numbers on that, Moxiware. Their case is better than all the garbage on this list.